Pater Noster is a unique lighthouse that lies in the archipelago approximately 4nm (5,5km) outside Marstrand. The Lighthouse is located on the tiny island of Hamneskär. The island is about 250m long and 120 m wide. On the island is a small hotell/guesthouse and 10 rooms with very good standard as a 3 star hotell with a 5 star wive. The facilities includes rooms with sea view, 1 restaurant, 2 hot tubs, 3 boathouses for dinner and conferences and a newly renovated spectacular lighthouse Pater Noster. 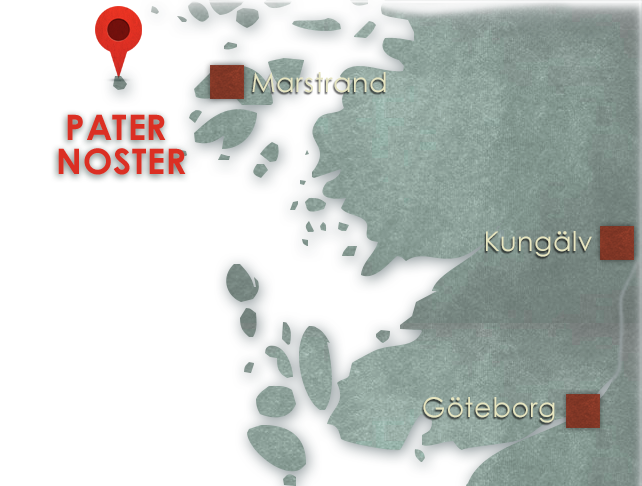 It takes about 10 minutes from Marstrand to Pater Noster with our boats. We only sell all inclusive packages. You will not be disappointed. Experience Pater Noster and number of deserted claims along the coast. Climb the famous lighthouse and follow in the footsteps of Carl Gunnar Taube, Evert Taube father. What can be more exciting and exclusive than living on a little island with you very own lighthouse? 15:30 Arrival. Welcome snack at the boat-house. 19:30 Grill- or seafood buffe in the boat-house. Experience a unique atmosphere with a conference on Pater Noster. We guarantee a exclusive conference that can only be experienced here.